I have worked for VESC for the last 4+ years. I truly love coming to work because I love being able to help people and their pets, and I understand first hand what it feels like to have a pet that is not feeling well and just how stressful those times can be. 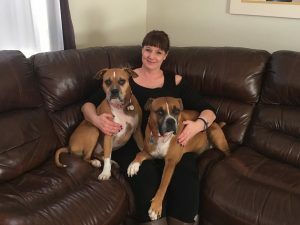 When I am not at work, I enjoy spending time with my 2 Boxers, Smokey and Shasta, and my African Grey parrot Lucky, as well as my husband and son. There is never a dull moment in my household! I am very blessed and love them all! I am grateful to have the opportunity to work with the amazing doctors and all of my coworkers here at VESC, and to be able to contribute my experience, compassion, and expertise with our clients.